Adm. Timothy J. Keating saluted the audience yesterday after assuming the U.S. Pacific Command from Air Force Lt. Gen. Daniel Leaf. Lt. Jack Keating told son Timothy about the expanse, challenge, wonder and opportunity of the Pacific after being stationed at Kaneohe Bay during World War II. Jack Keating believed "in the power of the Pacific," Adm. Timothy Keating said yesterday. Now, Timothy Keating will maintain that power by leading the oldest and largest U.S. unified command. Keating, 59, became commander of the U.S. Pacific Command yesterday during a ceremony at Camp Smith. He is the 22nd commander of the Pacific Command within the last 60 years. Keating succeeds Adm. William Fallon, who now commands troops in the Middle East. To stand with loved ones as commander of the Pacific "means more to me than I could tell you," Keating said during his change-of-command ceremony. More than 600 people attended the ceremony, including U.S. Secretary of Defense Robert Gates and former Pacific commanders-in-chief and commanders such as Fallon, Adm. Ronald Hays, Adm. Richard Macke and Adm. Thomas Fargo. Other guests included Gov. Linda Lingle. Gov. Linda Lingle, right, was among more than 600 attendees at the Camp Smith ceremony. Air Force Lt. Gen. Daniel Leaf, deputy commander of the Pacific Command who served as acting commander until Keating filled the post, said during the ceremony, "He is a team player, a team builder and a team leader." Keating will build on the accomplishments of Fallon and his predecessors, Leaf added. Gates said Keating's military career thus far has been groundbreaking. His latest post will be his sixth joint tour. "His area of responsibility ranged from our nation's cities to coastlines to outer space and everything in between," he said. 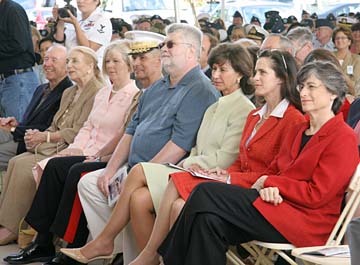 Keating was commander of U.S. Northern Command and the North American Aerospace Defense Command before he was selected by President Bush to head the U.S. Pacific Command. Given his record of accomplishments and challenging assignments, Gates said Keating is perhaps one of a few who would find heading the Pacific Command -- which covers more than 50 percent of Earth's surface and 43 countries -- "slightly less daunting." During the 1980s, Keating was based at Camp Smith and served as a supply lieutenant under former U.S. Pacific Commander-in-Chief Adm. William Crowe Jr.
Keating said he is delighted to return to Hawaii. "We got off the airplane Friday, and we wondered why we ever left," he said. 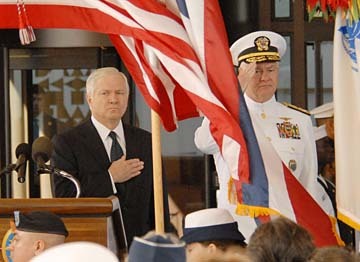 U.S. Defense Secretary Robert Gates, left, and U.S. Adm. Timothy Keating saluted yesterday during the presentation of the colors as Keating assumed the helm of the U.S. Pacific Command. Keating plans to focus on working with ambassadors and the young men and women in uniform. "That is what we will be about in the Pacific -- service to our friends, to our allies, to all departments," he said. After the ceremony, Keating spoke to the media about issues involving North Korea and China. "The six-party talks are proceeding albeit a little bit on and off, but we're very interested in what our State Department partners are achieving in North Korea and we're cautiously optimistic that the way ahead is hopeful for peace on the peninsula," he said. Keating also noted that he will carry on Fallon's work and spend more time working with counterparts in China to foster relations. 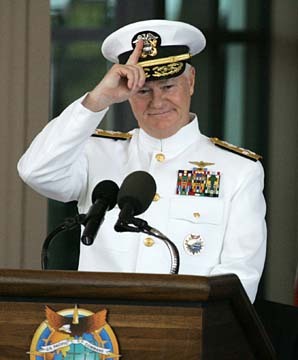 Gates said: "Adm. Keating fully understands the challenges of today. During numerous tours of deployment across the Pacific and Indian Oceans, he has developed a keen appreciation for what he calls the vibrancy and complexity of this vast region. "He is fully committed to defeating the enemies who threaten our security and stability."